Having been in business for over a century, Federal Companies has long differentiated itself from other moving companies through our commitment to quality and customer-oriented service. We proudly have gone through the qualifications to be certified as a ProMover by the American Moving and Storage Association. ProMover is the official seal of approval that displays our dedication to moving you at a higher standard. 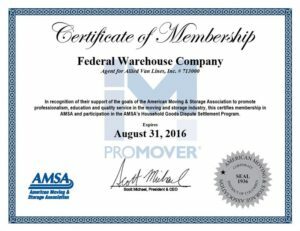 The ProMover status from AMSA works to identify reputable, quality movers like Federal Companies from those that are unreliable and unproven. As a business that goes above and beyond the industry standard, as well as operating with strict policies of integrity, ethics, and honesty, we have earned our ProMover badge proudly. When you choose a ProMover moving company, you’re inadvertently getting backed by AMSA. It shows that no matter how complex or how far your relocation operation is, that you can depend on the professionalism, training, and commitment of our movers. Get a move that is efficient, streamlined, and affordable with our ProMover moving company. Are you ready to begin the moving process? Contact the moving experts at Federal Companies today. Call a representative to learn how our quality services have kept us in business for over 100 years. You can also fill out an online form to request your free, in-home estimate.